Is That Outlet or Light Powered Up? Determining whether a household circuit is powered, live, and hot can be as simple or as complicated as you like. Methods range from easy and free (by using a working lamp) to an extremely expensive device that uses radar waves. Before performing any electrical work, use any one of four methods to help you figure out if that outlet, light switch box, or ceiling light box has power running toward or through it. If you have any reservations about working with household current, call an electrician. While electrical work is one of the more expensive trades to call to your house, it is far cheaper than a trip to the emergency room. This classic method of testing for power could not be simpler. If the current is running to an outlet, then it will power a light. If there is no power, there is no light. That is the simple premise behind this method. There is no reason why you cannot use this to test the occasional outlet. But if you plan to do any amount of do-it-yourself electrical work, you should buy a voltage tester. This method is fine for testing one or two outlets, but carrying the light and cord can get tedious. Cheap and easy to use, a small hand-held voltage tester represents the sweet spot in electrical testing tools for do-it-yourselfers. A voltage tester is a lifesaver. 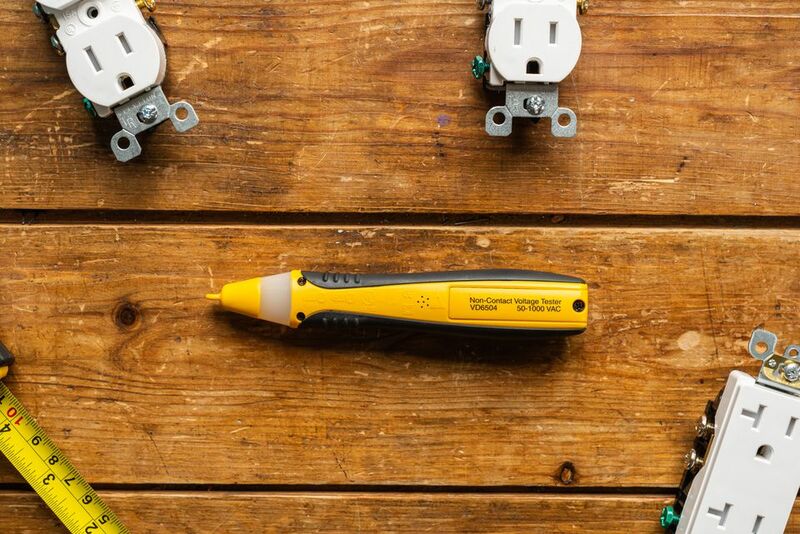 Unlike other helpful, time-saving home remodeling-related gadgets that we like to call lifesavers, electrical voltage testers day in and day out aid in the prevention of injury or death from accidental electric shocks. Inexpensive and reliable voltage testers like the Klein Non-Contact Voltage Tester can detect electrical current without touching the exposed wires. Hover the tip of the voltage tester about one inch from the wire and the tester will chirp and flash a light if a current is detected. One downside of these pen-style voltage testers is that they cannot detect current in low voltage devices, like pathway lights or small home appliances. For that, you need a multimeter. Do not confuse with a voltage meter, which indicates the precise voltage of electricity. A voltage test is an on/off tool. "On" means that there is electricity; "off" means there is none. If the batteries fail, it may appear that the current is dead even if it is not. Note that you should always test the voltage tester before using it. Even if the batteries are good, these items are notorious for providing false-positives and false-negatives. A false-positive is when the tester beeps, but there is no current. Of greater concern is the false-negative, when the device does not beep even though the current is flowing. While they are highly accurate, multimeters are overkill for most home electrical use by do-it-yourselfers. In addition, multimeters can be difficult and confusing to use for many do-it-yourselfers and thus may lead to injury. However, for lower voltages and for determining what that voltage is, you will need a multimeter. Multimeters have been used and adopted by millions of amateurs throughout the years. The note of caution is to become fully educated in the operation of multimeters before attempting to use one. Ultra-wideband (UWB) radar devices like the Bosch D-Tect are not used for normal detection of live currents. However, a UWB device is the only tool available on the consumer market that will detect powered-up, live electrical cables behind drywall, without tearing out the drywall. Because of its extremely high cost and difficulty of operation, a UWB device is not a practical tool for do-it-yourselfers who wish to detect the presence of voltage. Find an electrical receptacle that you absolutely know is live. Typically, this is a receptacle that is already verifiably powering a large appliance, radio, TV, computer, or small kitchen appliance like a blender. Make sure that the outlet is powering the device by turning it on. Be sure to check both the top and bottom portions of the outlet. Insert the end of the voltage tester in both slots of the live receptacle. Depending on your model, the tester should flash, beep, or both flash and beep if the current is live. The reason for this step is that you want to make certain that the voltage tester is working. Dead batteries in the voltage tester may give the impression that a receptacle is safe to work on, even if it is not. For the safest operation, insert the end of the voltage tester into both slots of the receptacle. A flashing light or beep indicates if the current is live. As an additional precaution, after you open up the receptacle to work on it, you should once again test the wires inside of the box. Electrical wires are color-coded to indicate which type of wire they are. Black wire casing usually indicates that this wire carries an electrical load when powered up. Test these black wires and all other wires inside of the box. Hold the tip of voltage tester against the side of the electrical cord. Be certain to touch all the way around the cord. Three major wires (positive, neutral, and ground) run through most electrical cords. The voltage tester indicates a live current only when it is against the positive, or hot, wire. Is it Worth Buying a Wet Tile Saw?